With the end of the season in sight, you could forgive a midfield team like Toro Rosso for giving up on improving its current car and instead be focusing entirely on 2019. 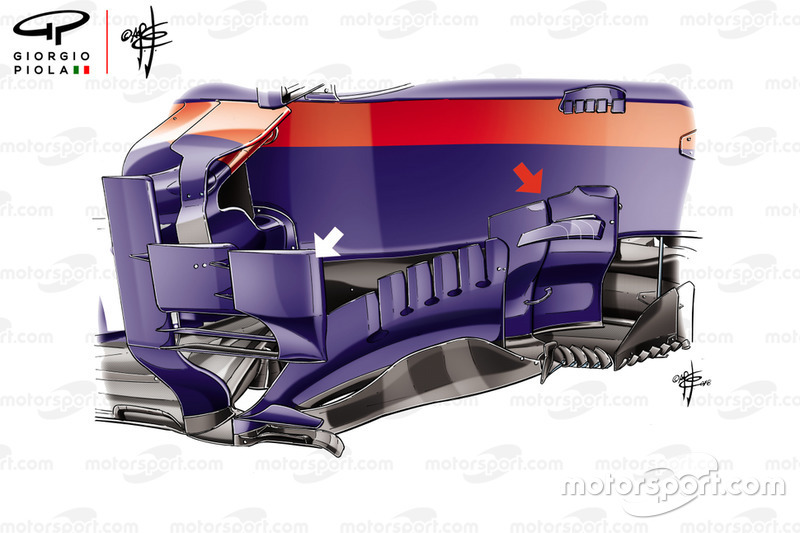 However, its STR13 has remained a sort of mobile laboratory as it, Honda and Red Bull have laid down the foundations for what they hope will be a good challenge in years to come. On the engine front, Honda has not hesitated in using Toro Rosso’s car as a test bench this year – which has helped it accelerate development on the power unit front. Working closely with Toro Rosso, it has been aggressive with its update policy – even if that has meant a raft of grid penalties for drivers. Such rapid change on the engine front is not easy for the team either, with the ancillary coolers, pipework and other associated paraphernalia all having to be re-engineered to take into account the base architectural alterations. But pushing forward with developments has not been restricted to the power unit because on the aerodynamic front Toro Rosso has done a lot too. Most recently it introduced in Austin an update that left the drivers very encouraged. Due to the poor weather conditions on Friday, and only having one set of parts, the team decided it best not to risk racing it in the United States. Instead, it saved its introduction for the South American leg, when it could get a clearer understanding of the performance increase it could deliver. The new package included, but was not limited to, a revised front wing, bargeboard optimisations and a new sidepod deflector panel. 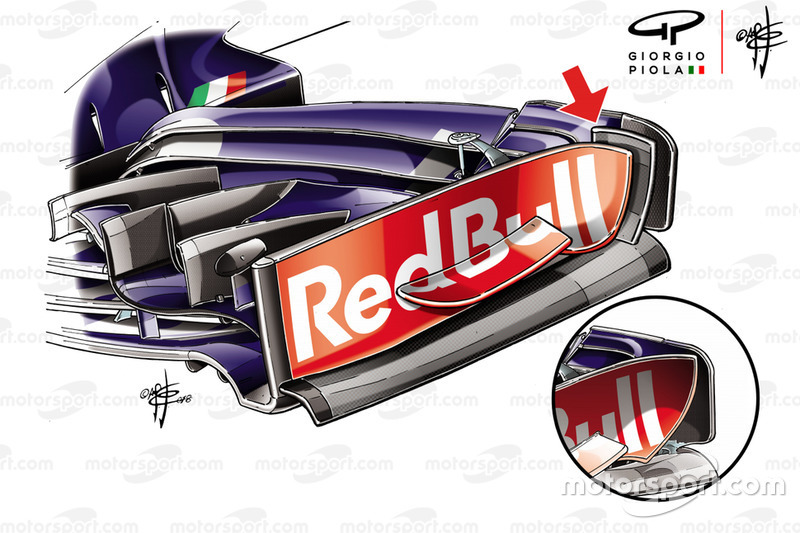 Inspired by the route taken by some of its rivals this season, the revised endplate design features a shorter reprofiled tail end, with another flap positioned between it and the back face of the wing stack (arrowed). The wing also features a revised flap adjuster position, resulting in much less of the flap being affected by any manual adjustment. This should empower the arched outer section of the wing, increasing the amount of outwash that it can generate. The team also trialled a new set of bargeboards and sidepod deflectors, as it looks to improve flow along the cars flanks. The bargeboards, which have already been altered numerous times this year, featured a two-piece vertical element at the front (red arrow). The number of deflectors also increased from two to three elements (white arrows), altering the point at which the surfaces meet the wake generated by the front tyre. It’s worth noting that this element also features horizontal tail like extensions that control the shape and direction of the airflow that passes by them, in a similar fashion to other teams that use this sort of deflector configuration.